This article has been republished with the permission of Furniture Today USA. Ikea founder Ingvar Kamprad, who turned his passion for improving “everyday life for the many” into the world’s largest furniture retailer, died at his home on Saturday. He was 91. 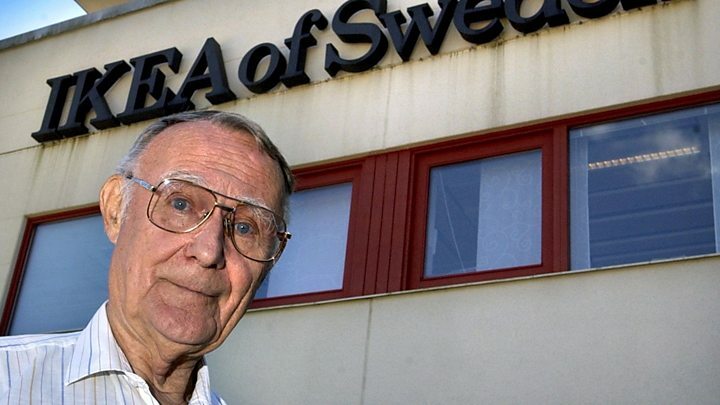 He was born in Småland in Southern Sweden, in1926 and founded Ikea at the age of 17. That set the stage for what would become the world’s largest furniture retailer, with worldwide sales of more than $40 billion in its last fiscal year and 412 stores in 49 markets, including 47 U.S. stores. The retailer is No. 3 on Furniture Today’s Top 100, with estimated furniture, bedding and accessory sales of $3.2 billion at then 42 stores for its 2016 fiscal year. Kamprad did not have an operational role at Ikea since 1988 but continued to contribute as senior advisor, “sharing his knowledge and energy with … co-workers,” the company said. “We are deeply saddened by Ingvar’s passing. We will remember his dedication and commitment to always side with the many people. To never give up, always try to become better and lead by example,” Torbjörn Lööf, CEO and president of Inter IKEA Group, said in a statement. “His legacy will be admired for many years to come and his vision — to create a better everyday life for the many people — will continue to guide and inspire us,” said Jesper Brodin, CEO and president of the Ikea Group. Kamprad also was the founder of Ikano and an international group of companies operating in finance, insurance, real estate and retail fields. Posted in Industry News and tagged architecture, art, australia, business, decor, design, furnishing international, furniture, furniture today, home, homewares, IKEA, industry, industry news, interior design, interiors, Sweden, USA. Bookmark the permalink.